Lunch was inspired by a Pinterest find for a smashed chickpea sandwich. I changed it to my taste. The lime is very powerful, so if you are not a fan, leave out the lime zest. The salad texture made me think of egg salad for some reason – the taste though is vibrant and fresh! Walker helped me make lunch for Kirk and I, by eating the garbanzo beans while my back was turned…. Drain and rinse the chickpeas, add to a large mixing bowl. Split the avocado in half, remove the pit and pop the flesh out with a spoon into the bowl. Zest the lime with a microplaner, juice the lime and add to the beans, along with the pepper. Mash together with a potato masher, season to taste with salt. 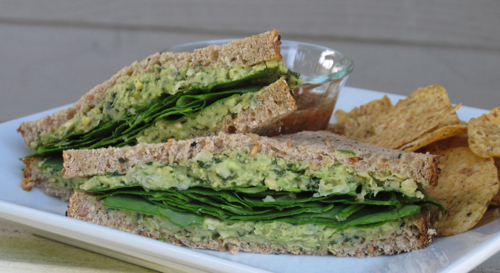 Spread the mixture on 4 slices bread, top two slices with the spinach. Carefully top with the other slices, pressing down gently. Cut in half and serve.